This Villa is 350m2 + the pool of 80m2 and 450m2 including outdoor areas (decks, verandas, parking areas). This amazing Villa has 3 different levels, 8 rooms and a private pool. Facilities like a wooden bar in the pool area, offer the guests the ability of sharing amazing moments just in front of the big blue, enjoying parties, gatherings and unforgettable wedding experiences. 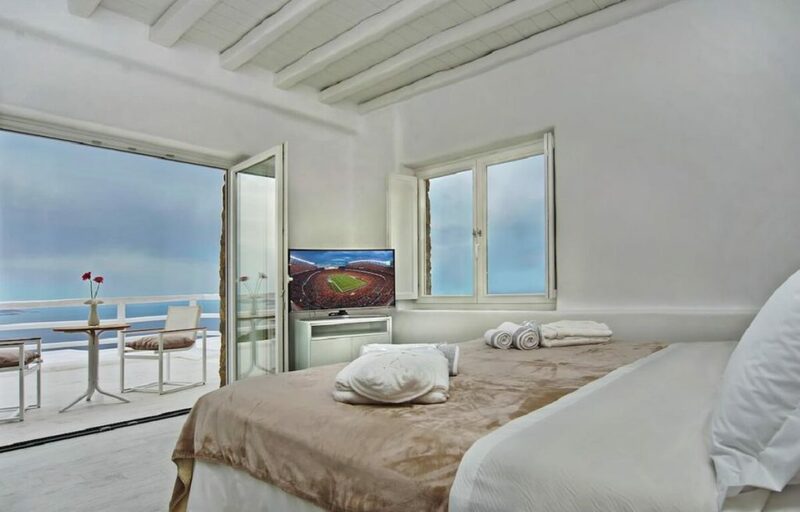 The Villa is totally covered from the wind-which is extremely important for an island like Mykonos and it offers you an amazing View not only during the day, but during the night as well, as you can relax just in front of the city lights in a totally romantic and peaceful atmosphere. 5 en-suite rooms with private balconies all with an amazing Sea View, aircondition in all rooms, safety boxes, TV and CD players. There is 1 additional guest room with a private entrance. Main entrance, pool area, bar, sun lounges, hammocks, sunbeds, BBQ, outdoor dining area, salon with table for 12 guests, kitchen and 1 Master room- all areas are fully air-conditioned. Master room with its own private wooden veranda and private massage, yoga and relaxation area with sun lounges and sunbeds in an open space surrounded by one back stone wall and one right side glass wall, leaving open the front and left side space offering an open living room with infinitive sea view. The ceiling is a wooden pergola thus giving the master room its own private outdoor balcony.